This is the BEST Potato Salad that I’ve EVER had! It’s a heritage recipe & the ‘secret ingredient’ is what makes it so good! When I tell you that this is the BEST potato salad I’ve ever eaten, I’m not yankin’ yer chain one little bit. 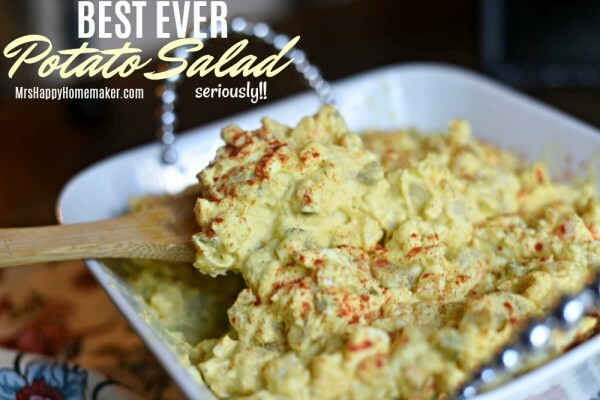 It’s the best of the best… and I’ve eaten a lot of darn good potato salad over my years. But this one… this one. This one is special. This recipe has been handed down 3 generations in my best friend’s family. You can say it’s stood the test of time. The reason it’s so delicious is it’s ‘secret’ ingredient…. It really makes such a difference – and it’s absolutely perfect. Boil the potatoes whole in the skin until fork tender, about 20-30 minutes. Run water over the potatoes to cool. Peel & chop the potatoes. 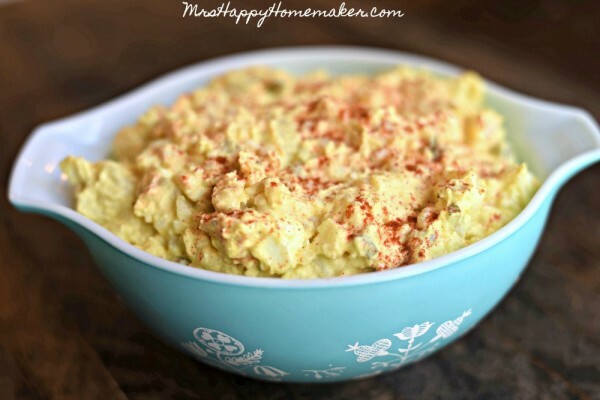 In a large bowl, combine the potatoes, eggs, onion, dill pickles, mayo, & mustard. Pour in the dill pickle juice & stir to combine. Season to taste with salt & pepper. Sprinkle with paprika, if desired. Refrigerate until serving. I have put pickle juice in my potato salad and macaroni salad for yrs. So it’s no secret to me sorry. I’ll swear this is my mother’s recipe from long ago. Unfortunately, she was one of those who remembered recipes and never wrote recipes down. I don’t remember so much onion, by everything else down to the bowl and the paprika! Deeeelicious! I’ve been making it this way ever since my mom taught me when I was in 6th grade. Great stuff!!! I put cut up green olives in my potato salad and I also use the spicy brown mustard instead. to make this BETTER– after boiling the potatoes, and draining, pour about 1/4 c pickle juice over the HOT potatoes. allow to soak in till potatoes are cooled, then proceed as directed above. Add artichoke hearts makes it even better!! We don’t measure anything, but those are the same ingredients that have always gone into our family’s potato salad, too. 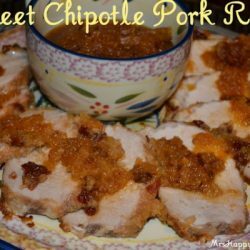 It’s why I can’t stand storebought…which always seems to be made with sweet pickles – yuck! 🙂 That does sound like an awful lot of onions, but it may depend how big the potatoes are. Memories of my Aunt Jeeber’s Tater Salad in Tennessee <3. Thanks for sharing. 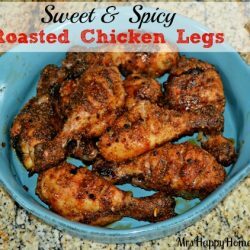 How many servings is this recipe good for? About 6 servings, maybe 8 depending on how much everyone is eating. 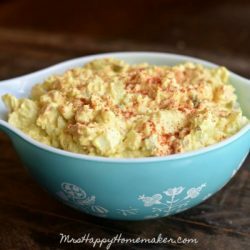 My mom always made this potato salad and it was a favorite! 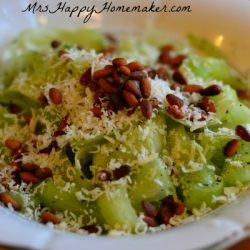 She passed away from cancer at age 57 this April and she requested that this be served at her funeral–and my sister and I had to make it because we were the only ones who would get it right:-) The only thing missing from your version is dill weed. She was a “handful of this, pinch of that” kind of cook, so when we made it for the funeral that’s how we did it! It’s how she taught us. When I saw your video I just was looking at each ingredient going in and when you had it all mixed up with no pickle juice I thought you had it all wrong! But then you saved yourself:-) Most of the time growing up we used sour cream instead of the mayo, and eventually started doing half and half. Too much mayo is a little too rich, but the sour cream tones it down, and just straight sour cream isn’t quite as flavorful. I never comment on these things, but I had to this time! I just love this comment so much! I’m sorry you’re mom passed so young – losing those we love is never easy. I think it’s so cool that y’all made the potato salad to help remember her by though, what I wonderful idea. Thank you so much for commenting! 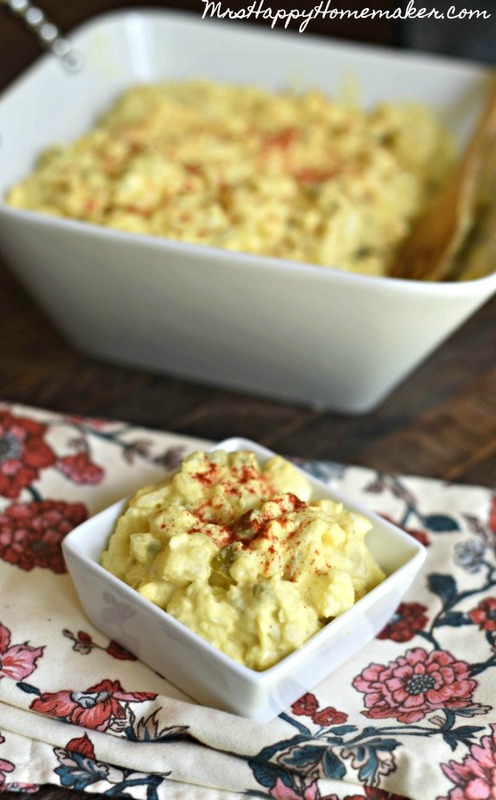 The potato salad is definitely a favorite of ours as well, and you’re right – that pickle juice makes it!